The clinical management of Ebola created a significant challenge during the outbreak in West Africa, due to the paucity of previous research conducted into the optimum treatment regimen. That left many centres, to some extent, having to ‘work out’ best practice as they went along, and attempting to conduct real time prospective research. Médecins Sans Frontières (MSF)  were the only organization to have provided relatively in depth practical guidance prior to the outbreak and this manual was the basis of further planning between the WHO, national Ministry of Health and Sanitation in Sierra Leone, and other relevant stakeholders. Additionally, guidance changed over the epidemic as experience grew. This chapter will describe four key areas in the management of Ebola in West Africa. 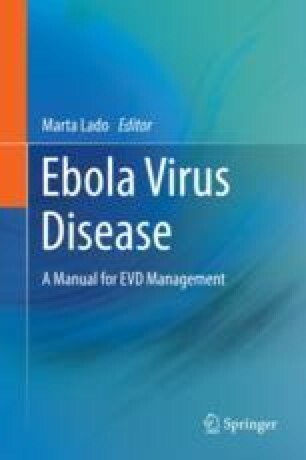 Firstly, it outlines the most recent WHO guidance; secondly, it looks back at how Ebola was managed in differing low and high resource settings; thirdly it outlines possible and optimal options for managing complications, paying particular attention to some of the controversies faced; fourthly it describes recent and ongoing studies into potential novel therapies that may shape future practice. Maternal Mortality Estimation Interagency Group. Maternal mortality 1990–2015, Sierra Leone. 2016. http://www.who.int/gho/maternal_health/countries/sle.pdf. Retrieved 2 Apr 2016. World Health Organization. WHO | Stillbirths. 2016e. http://www.who.int/maternal_child_adolescent/epidemiology/stillbirth/en/. Retrieved 25 Sept 2016. Caluwaerts S, Lagrou D. Guidance paper Ebola Treatment Centre (ETC): Pregnant & lactating women. Table of content. 2014. Retrieved from https://www.rcog.org.uk/globalassets/documents/news/etc-preg-guidance-paper.pdf. World Health Organization. WHO model list of essential medicines 19th list WHO model list of essential medicines (April 2015) Explanatory notes. 2015c. Retrieved from http://www.who.int/medicines/publications/essentialmedicines/en/. World Health Organization. Guidelines for the treatment of malaria. 3rd ed. 2015b. Retrieved from http://apps.who.int/iris/bitstream/10665/162441/1/9789241549127_eng.pdf. Dörnemann J, Burzio C, Ronsse A, Sprecher A, De Clerck H, Van Herp M, et al. First newborn baby to receive experimental therapies survives Ebola virus disease. J Infect Dis. 2017;jiw493. https://doi.org/10.1093/infdis/jiw493.